Donald Trump’s vice presidential candidate Mike Pence killed it at last night’s debate against Tim Kaine. Poll after poll shows that not only did he win the debate, he gave Trump some momentum in the polls as well. So naturally, the media has been anxious to spin it in a negative fashion. But Eric Trump wasn’t having any of that. He went on a CNN panel Tuesday night after the debate and he gave the liberal panel some major blowback when they tried to go after his dad. The panel initially began talking about Pence’s performance, which Trump praised, saying he did “incredibly well.” They spoke about how America has lost respect on a global scale under the Obama administration and at first, all went well. But then the conversation went south when the panel brought up Trump’s tax returns. Unfortunately for the panel, though, Trump wasn’t taking the bait. 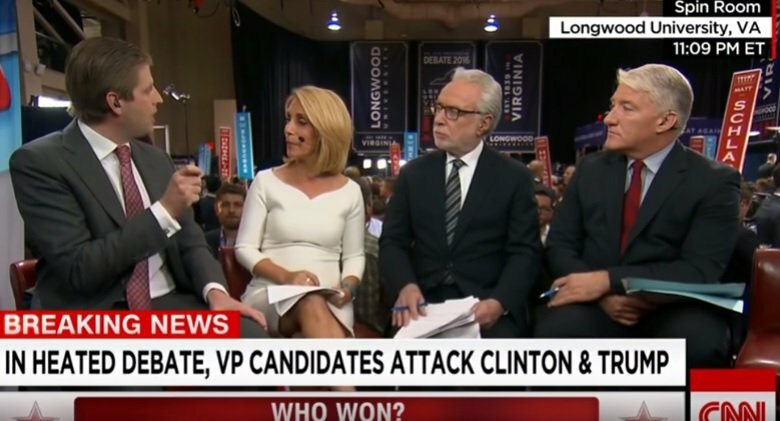 The panel, made up of Wolf Blitzer, John King and Dana Bash, repeatedly grilled Trump about his father’s tax returns and whether or not his father pays federal income taxes. Trump not only answered the questions asked of him by the panel, he also brilliantly redirected the conversation towards Hillary Clinton and her many scandals, failures and corrupt actions. He performed so well, in fact, that even the panel couldn’t deny it. “Eric, I’m pretty impressed, actually,” Bash admitted. Trump’s tax returns is a valid concern and really, if he had been smart enough to release them earlier in the election cycle — say, during the primaries — all of this would be irrelevant because it would be old news. His mistake has been his lack of transparency more than anything else. But the thing is, this is hardly the most important issue facing the American people this election season. There are more important things that can and should be discussed by the media. Yet they can’t leave this alone. 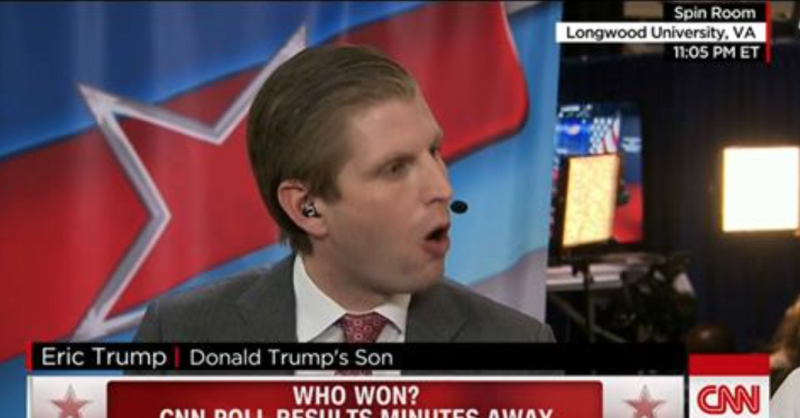 Good for Eric Trump for not letting them get away with it.